My kids were giddy with anticipation over Halloween this year. Their experience of their first American Halloween had been a wonderfully positive introduction to life in America for them. They loved everything about it and were eager to repeat the same fun experiences this year. Having selected a pumpkin each when we visited the pumpkin patch, the boys settled on imagery and I set about carving them. The reason I did the carving is that, with the exception of the smallest pumpkin, which really was tiny, the skins and flesh of the chosen pumpkins was extremely tough. I resorted to using exceedingly sharp kitchen knives in place of the carving tools and, of course, the children could not be let loose with kitchen knives. That really would have been a Halloween horror! So we ended up with a large Minecraft Creeper, a baby Creeper, a galloping horse and the head of Jack Skellington to place on the steps leading up to our front door. 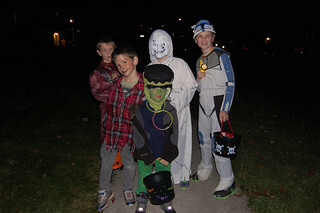 The younger three boys had Halloween celebrations at their Elementary School. 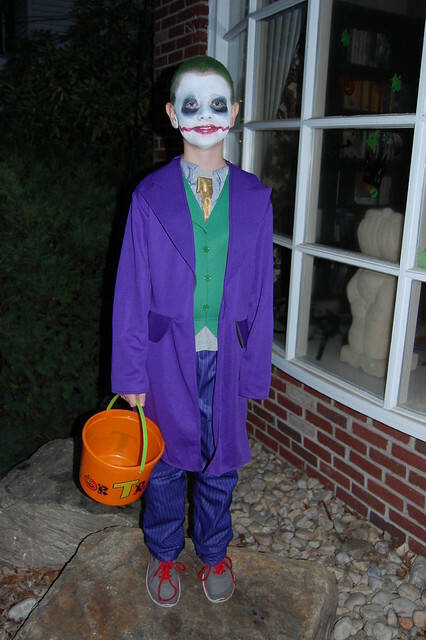 They each had parties full of crafting, snacking and games and were all involved in the Halloween parade. The High School band played while all of the costumed children walked in a large square on the playing field. As a member of the first Kindergarten class, our 5 year old was actually the leader of the entire parade. 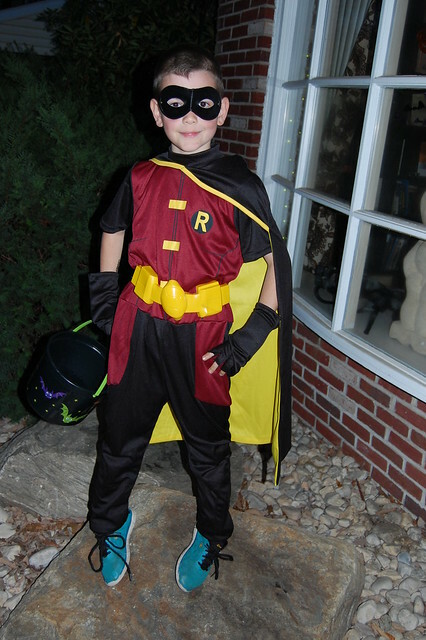 He was clearly loving it, waving to the crowds as he passed them, though his Iron Man mask meant he could barely see where he was going and he had to be steered in the right direction by his teacher. That morning I had told the children that I was going to levy a tax on them of one piece of their Halloween candy for each Elsa, Anna or Olaf costume we happened across on the day. There were five Elsas in my youngest son’s class alone. My kids said no dice to the tax proposal. There were some really inventive costumes on show and it was fun to see all of the kids enjoying themselves. 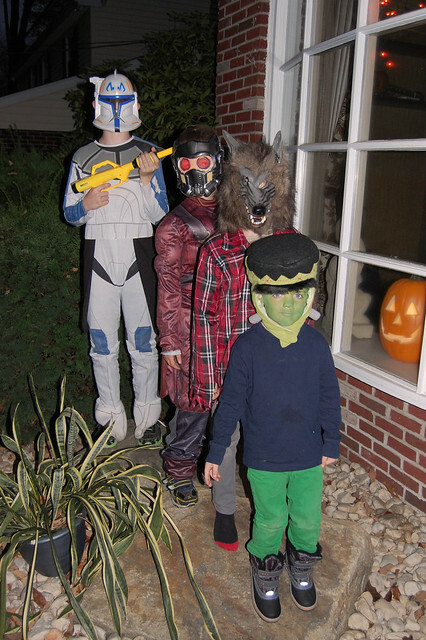 My boys had daytime costumes, appropriate for school (Iron Man, Boba Fett and a weird Dark Knight Ninja combination that my 9 year old insisted on cobbling together) and different costumes for evening. I got the majority of their costumes from thrift stores and the younger ones like to play dress up throughout the year so I don’t mind the costume changes at all. 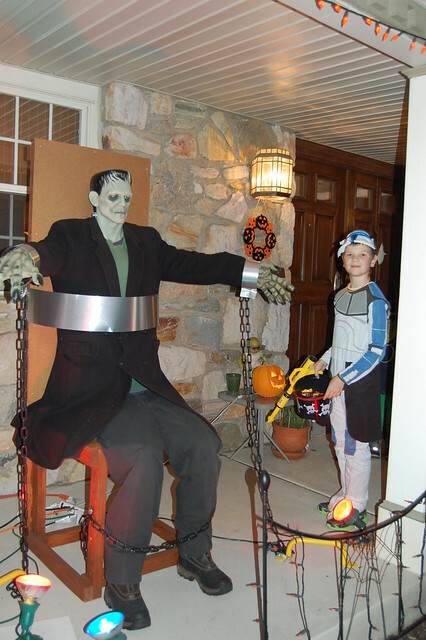 My oldest son was a Clone Trooper, the 9 year old was Star-Lord (because he is obsessed with ‘Guardians of the Galaxy’), my 7 year old was a Werewolf (he has been longing for a werewolf costume for years) and the youngest was Frankenstein’s Monster (his favourite classic monster). I also dressed myself up as a Vampire, complete with pallid face and bright red lips. 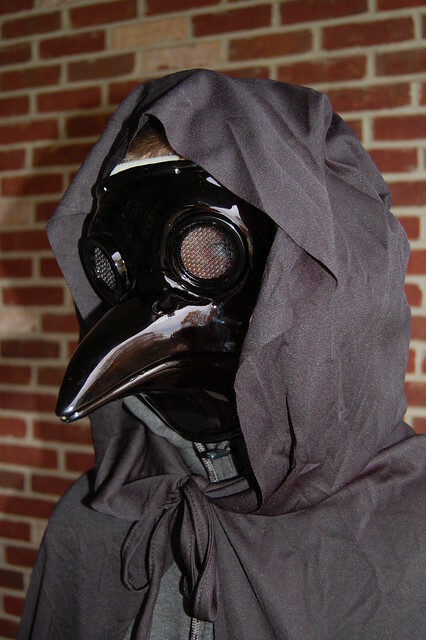 Thankfully I was not the only adult wandering the streets in costume or I might have felt like a total pillock but the kids appreciated my efforts and my get-up entertained them so any embarrassment factor was worth it. 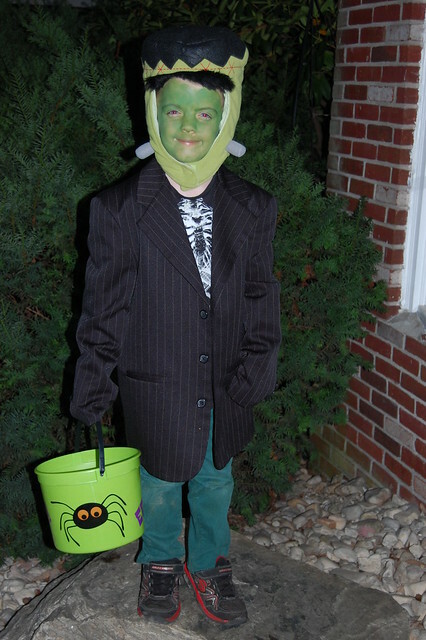 Together with one of the boys’ friends, my monstrous mob traipsed the streets of our neighbourhood for two hours. Mr Pict had devised the route as if he was a military General manouvering troops. At first they were part of a pack of neighbourhod kids but gradually they pack drew out into a long line which was probably easier for each household to manage instead of having to open the door to a dozen kids bellowing “Trick or Treat” in unison. The majority of houses in our neighbourhood were participating in Halloween and handing out edible treats but some had gone to incredible effort to entertain the little ghouls. One house had set up their garage as a den of horror. My 9 year old and his friend refused to even enter and the 7 year old came out howling, but the other two loved it. Another house had set up three rooms in their house to be a haunted house full of spooky props and people in costume. My 9 year old again didn’t go in but everyone else had fun on their spooky tour. 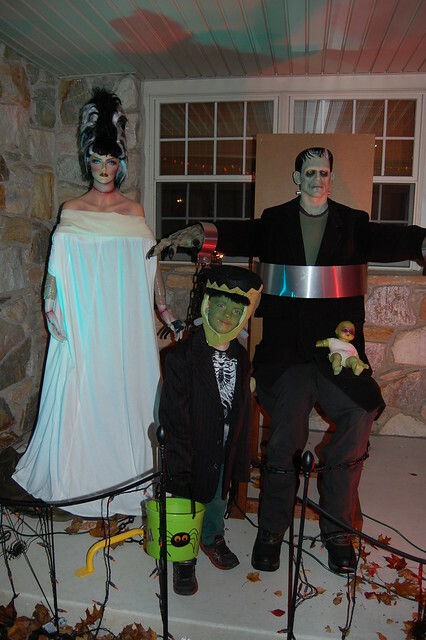 Our neighbours had set up their porch with elaborate decorations including a zombie baby doll, Frankenstein’s Monster sitting in an electric chair and the Bride of Frankenstein standing alongside them. My boys loved going up to the Monster, especially the little one who declared he was Frankenstein Jr. It was a really fun night and my kids came home with their Halloween buckets full to beyond the brim with sweeties, chocolate and crisps which they then spent half an hour trading up. And they never did give me my ‘Frozen’ tax. Next week will mark six months since my four kids and I emigrated from Scotland to America. Really I ought to have written this blog entry next week, therefore, but things are already crazy busy and are going to be even more hectic next week (all to be related here) so I am pausing to take the time to reflect now on what has happened in that six months. The minute I walked out into the airport at Newark to be greeted by my husband, having been processed through immigration with relative ease, I felt instant relief. Partly, of course, it was because we were reunited as a family again but it was also because that last step was the culmination of a very stressful eighteen months of discussions, decisions, applications, learning immigration law, interviews, sorting, packing, donating, fraught goodbyes and separations. At the time it did feel stressful because it was an awful lot to juggle but I don’t know that I had appreciated quite how much of a burden of stress it was until I was relieved of it and it had all been worthwhile because we were there, in America, as a family. All of that effort, stress, expense and upheaval had actually achieved the goal. Of course, the immigration saga has not completely ended since USCIS stuffed up and my oldest son still does not have a Green Card. However, that is stress borne of frustration and annoyance and a sharply honed sense of injustice which is not on the same scale as the stress of the previous eighteen months. Driving was a major cause of anxiety for me in the build up to relocating to America. I really thought I would find it a struggle to switch to driving on the other side of the road and to get to grips with driving an automatic car since I have always had a manual car. I decided, however, to flood my fear so the morning after the night I arrived in the US, I clambered into the driver’s seat of the car and set off. I have never once even accidentally almost been on the wrong side of the road and my lane positioning has been pretty good from the get go. I still hesitate to turn on red but I think that is sensible. It’s evolutionary instinct surely. I managed to pass my theory test without even studying (not because I was nonchalant or complacent but because I had not understood I would be made to sit it when I went to get my permit) and recently I even managed to pass my driving test despite the fact I was wigging out over the parallel parking element. That said, as much as I have driving sussed now, I still suffer from left-right confusion here. Just the other day I went to a grocery store and tried to enter through the exit because the doors are the other way around and then, driving home from there, when a driver kindly let me into his lane, I held my left arm aloft for a wave of gratitude. A wave he could not see because that was not the middle of the car. He would have seen the wave had I used my right arm. Conversely, I thought shopping and cooking would be easy-peasy-lemon-squeezy but that has not been the case. The supermarket layout defies the logic I am used to. Shopping consequently still, six months on, takes me much longer than it should do as I double-back on myself or type things into the console so it tells me what aisle an ingredient is in – just for me to not then be able to find it in that aisle anyway. However, progress is being made since in just this past month I have weaned myself off asking members of staff where on earth something is. The cooking thing is complicated by the lack of access to ingredients I simply took for granted in Scotland and then even if I do find them sometimes those ingredients (spices in particular) are way more expensive here than they were in Scotland. So I am learning to cook with lots of substitutions which involves some experimentation with varied rates of success. Our biggest accomplishment since transplanting our family to the other side of the Atlantic – and the kids only had a short while to get used to the idea – is how well the kids have not just settled but have established themselves in school. Our oldest son has had to undergo quite a lot of relearning in order to accommodate the American curriculum and things like weights and measures and general knowledge that is specifically American but he has absorbed it all like a sponge and acing tests. The younger ones had it easier because they are that bit younger so the learning is fresh to them but still things like their vocabulary have just switched in a way that they have not for me even when I am trying to make a conscious effort to speak the American way (trousers never emerges from my mouth as pants and Z is still zed and not zee). They all love being taught by subject specialists for certain areas of the curriculum, love not having to wear a uniform and have generally been positive and enthusiastic about their new school in a way that Mr Pict and I never could have anticipated. In fact, we anticipated resistance and rebellion. We were very happy indeed to be wrong. The kids are also enjoying the proximity of everything to home. If they need new shoes then it’s a five minute trip rather than an hour at the shortest. Within a half hour radius we have access to cinemas, museums, galleries, parks, anything they can think of. Where we lived in Scotland, it was over two hours on crinkly, windy, travel-sickness inducing roads to get to the city to have access to those things. My womb is retired so this is no longer relevant but to deliver all of my babies I had to travel 90 miles to the maternity hospital. Now in under two hours I can be in the centre of New York City. Mr Pict and I have lived in Edinburgh and in the orbit of London so this is a lifestyle we are used to but the kids have only ever known life lived in a more remote community so this is a very different experience for them. I still cannot get used to how the TV works here. We have the internet version of cable (what is that even called? Streaming?) and Netflix. These are both systems that are new to me even if they are not new to other people in Britain. I watch some TV shows on demand but cannot remember the last time I watched anything (other than BBC World News and the Oscars) live which means I no longer have that experience of just stumbling upon a documentary or a great drama. The flipside of my TV viewing being intentional now is that I watch a great deal less of it. That’s probably a good thing. I do, however, need to remind myself to watch the On Demand programmes before they become extinct. I miss Sky+ for that reason as I guess I have become so used to series linking things and having them automatically record for me to view at my leisure that the bit of my memory bank that used to hang on to the TV schedule has atrophied. Netflix just drives me kind of batty. I miss the clubs I used to attend – a camera club and an art club – and I miss the camaraderie I found in being on the committee of the art club. It was great to have that impetus to get out once a week and do something creative with like-minded people and be inspired by them and learn from them. I definitely miss that. However, a new location has brought me new challenges as I joined an art journaling meetup group and am participating in an online art journal weekly challenge called The Documented Life Project. As a result, I am forced to find the time at least once a week to sit down and do something creative and, being new to mixed media work, I am learning new skills which I might take into my “regular” art work. Then once a month I get to meet up with a group of creative people and chart about art and be inspired by them and just (gasp!) be a grown up and do something for me. I would, however, like to eke out more time for my usual art work, ink drawings and lino block prints. Considering we moved to this town on spec, having never even visited this area of Pennsylvania before, we are really very pleased with our selection. We knew the school district was great because that was the basis on which we chose to live here but we really like the neighbourhood and the people are really friendly and welcoming and the geography works for us. We definitely want to put down roots here. Which is where the big stress comes in because – as much as all of these other things, the littler things – are coming together – the albatross around our necks is our house in Scotland. It still has not sold. There has been ample interest in the house but either people have houses to sell or they cannot obtain a mortgage. Living somewhere more remote and rural meant we could build a home (which was really our dream home) affordably but being somewhere so remote with such a small population means the real estate market is slow in the extreme. We have had people approach us with a view to renting from us but we have no desire to be landlords, especially absentee landlords, and even if we could overcome the logisitcal, financial, legal and taxation ramifications of becoming international landlords, when it comes down to it we need the house to sell in order to release the equity so that we can buy a house here in America. We, therefore, cannot risk taking it off the market for twelve months while someone rents it from us. We do love the house we are renting – the house itself, the street, the neighbours, the location – but it remains “the house” rather than our home because we cannot allow ourselves to get attached to it when we are merely tenants. Relinquishing control over property and permanency when we have been homeowners for such a long time is unsettling to say the least and the insecurity and instability of knowing what the future holds for us in terms of accommodation. That’s the stress that keeps me up at night if I let my mind linger on it. So that’s how things stand six months in to my life as a Scottish immigrant in America. I wonder what the next six months has in store. 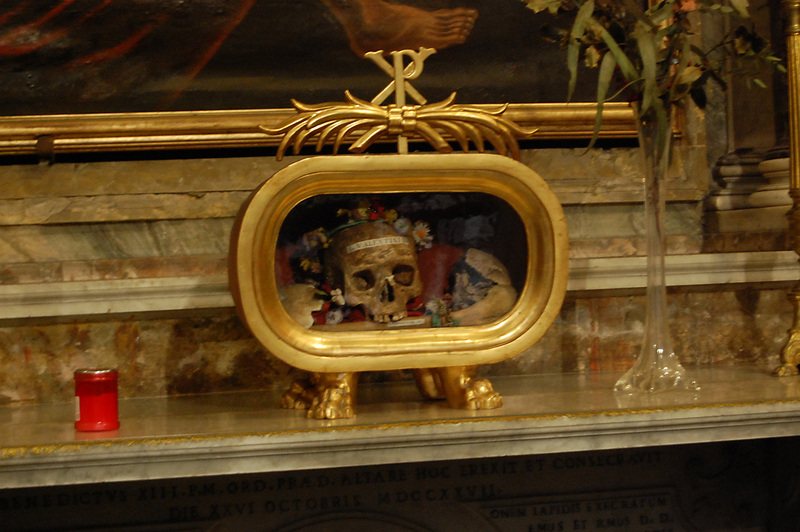 When I was in Rome a few years ago, we saw the (purported skull) of St Valentine. I am sure in life he was a stand-up guy but he has a lot to answer for. I loathe Valentine’s Day. With. A. Passion. An element of it is that I am hard-wired from experience to despise it. Every year, kids at school would pass anonymous lovey-dovey, bokey cards to each other. I would receive one card a year with handwriting suspiciously mature for your average 11 year old and somewhat reminiscent of my father’s script. As an adult I can reflect on that and think how sweet and thoughtful it was of my Dad to not want me to feel left out but at the time it felt like salt being rubbed in the wounds. It wasn’t really that I wanted a declaration of romance from some snotty nosed boy – because really I very much didn’t – but I was bullied for being a square peg all the way through school so Valentine’s Day was just another means to remind me of how unpopular I was, how left out I was. Of course, my super-popular younger sister would need a sherpa to help her transport home all of her cards. I might have been a wee bit bitter about that at the time. Then one year, when I was about 13, I received my one and only Valentine’s card and it was gigantic. Massive. It was over half my height and there was an icky, cutesy panda on the front. In one fell swoop it could have made up for all of those years of never having received a card. Except it didn’t. My epiphany that day was that receiving an obscenely proportioned card from a sproddy teenage boy who makes your spine judder is so very much worse than receiving no cards at all. So I took the card and shoved it in the outside rubbish bin – because it was too big for the kitchen bin – but my Mum discovered it. I learned I had been foiled when I walked into the living room and discovered the card, in all its gigantic glory, perched atop the television set. It was as if my parents had turned it into some sort of shrine. So I whipped the card from it’s place and ripped it into tiny pieces before placing it, once again, in the bin. This time my Mum decided not to stick it all back together and restore it. Job done. However, it is not just those childhood experiences that wrecked Valentine’s Day for me. I have been in a happy, loving, committed relationship for twenty years but Valentine’s Day is still not part of my calendar because I actually detest it for ethical reasons too. First of all the whole idea that there should only be one day a year when people express their romantic feelings to each other, having had to be prompted by the date to do so, is a complete and utter nonsense. If you want to tell someone that you fancy or love them then just do it when the feeling hits you. So you realise you like someone on 15th February – are you really going to wait 364 days before you tell them so? Of course not. So what is the point? The point is that having one day a year for designated romance means big business for card companies, florists and possibly even chocolatiers. It is all just commercial hype that people get sucked into. You walk into a shop with shelves stacked with random foods and objects covered in pink and red hearts and peer pressure kicks in. The panic of conformity. If everyone else is buying this heart covered tat then what happens if you go home to your beloved empty handed? So you buckle to peer pressure and clever advertising designed to play on your vulnerabilities and buy some tat. Think of the money those businesses rake in on that one day not to mention the boost for restaurants too. All those marriage proposals on Valentine’s Day too. How original. Thankfully Mr Pict and I have a pact to not submit to the commercialism and we don’t mark Valentine’s Day. People may judge but we don’t care. Non-conformity is a comforting feeling in the Pict family. So why am I blogging about Valentine’s Day weeks too early? Because I am irked that I am being forced to conform and that makes me loathe Valentine’s Day even more. The other day, I noticed a post on Facebook from a friend who lives in California. It was a link to lots of creative ideas for Valentine’s gifts for your kids to hand out. Woah, woah, woah! Kids hand out Valentine’s gifts in the US? I posed the query and friends confirmed that, yes indeed, it is traditional here in America for children to hand out cards and presents to their classmates. My heart sank and my blood boiled. Simultaneously. I pinged a quick email to one of my boys’ teachers in the hope that perhaps their school did not participate in this tradition but alas she confirmed that they have a Valentine’s party and kids exchange cards and gifts and they even make bags in which to collect all their heart-shaped booty. In Scotland, Valentine’s Day is very much the preserve of teenagers, courting couples and old marrieds. It is not for children. My kids have been raised in a culture where giving someone a Valentine’s card is a way of expressing your love for them, a way of indicating that you want to smooch them. I was not looking forward, therefore, to breaking the news to them. I predicted a full-scale rebellion. It transpired, however, that the word “party” took the edge off the news and I was emphatic in explaining to them that the card exchange would, at Elementary School age at least, be a declaration of friendship rather than of love. They were just about sold. So now I am being forced to conform. I don’t want my kids to not participate in events at school, I don’t want them to feel left out and I don’t want to foist all of my views on them either. Who knows, after all, maybe I am raising some budding romantics. I don’t see any evidence of that so far but you never can tell. So this year I am going to have to opt in to the rampant commercialism and buy packs upon packs of Valentine’s cards for each of my sons to hand out and, in turn, they will each tromp home with bags full of pink and red heart-shaped tat. So now I have another reason to find Valentine’s Day intensely annoying. 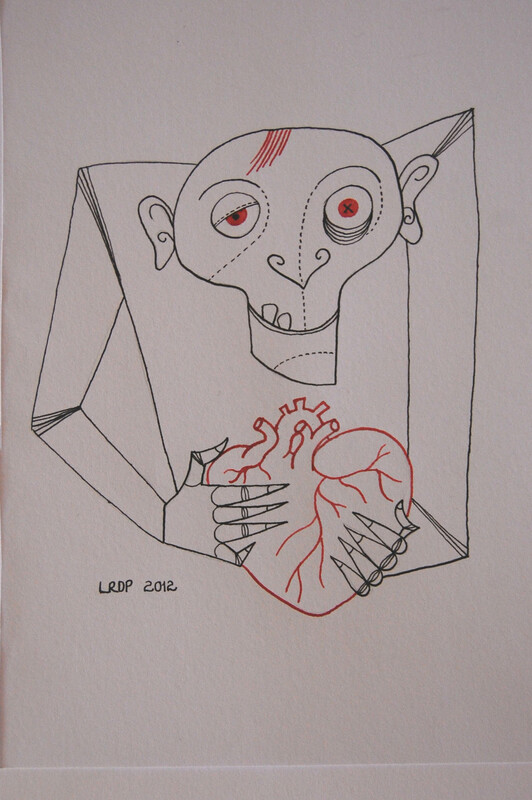 I will conclude this blog entry with my Zombie Valentine drawing from a Zombie of the Week project I set myself a couple of years ago. That’s all the Valentine’s romance I can muster right now. I am being scuppered by denominations here. Not religious ones, you understand: coins. Seriously, my kids can make change here better than I can. Obviously they had only just embarked on having to use coins in Scotland so it has not been such a big deal to toss that little slither of learning out of the window and start from scratch with American coins. For me, however, I am having to undo a few decades’ worth of knowledge, something that had become reflex, and learn something new. Apparently my brain is not coping very well with that. It’s all about the denominations. In Britain we have 1 pence, 2p, 5p, 10p, 20p, 50p and £1 coins; in America those denominations are 1 cent, 5 cents (nickel), 10 cents (dime) and 25 cents (quarter). There are also half and whole dollar coins but those are rare so I am discounting them. Clearly, therefore, I am used to adding and multiplying using different bases than are available here so all my maths (or math, as it is here) has to alter. I am not innumerate so that it is not that I can’t do it but I am very conscious that it takes me more time to rake around in my purse (wallet, as it is here) to find the coins I need and tot them up to the amount I need. And I have to keep reminding myself that the five cent coin is larger than the ten cent coin because they are the shape and size of UK five and ten pence coins but with the scale inverted. Two university degrees mean nothing when you are at the head of a queue of people who are all aware that you are taking an awkward amount of time to fumblingly make 68 cents. I got my UK driving licence at the age of 17 – the minimum legal driving age there – and I somehow managed to pass not only first time but with an entirely clean test sheet. I had had no more than ten formal lessons, a few trips around industrial estates with my Dad to practice maneouvres and my Grandad had made me do stunt driving a la Starsky and Hutch, like reversing around a series of cones, even though that was never going to form any part of any test. But still my instructor thought I was going to fail. Luckily this was in the age before separate theory tests. I still have no capacity for memorising statistics and numbers. There was never a chance I would be able to accurately recall all those stopping distances. Had there been a written test back then, I am sure I would have failed it at least once. But back then knowledge was assessed as part of the practical test so I didn’t let it vex me so much. My instructor decided it would be best if I did not sit the test at the nearest centre because I was constantly driving to where I thought I should go rather than where I was being told to go. I was just too familiar with the roads there. So instead it was decided that I would sit my test and the next closest testing centre which was a much smaller town. I soon sussed out that there were really only two routes I could ever be taken on my test since only those two routes would permit all of the components of the test to take place. I, therefore, set out to memorise every details of those routes even down to how many turns of the wheel were required to reverse perfectly around each corner. Still my instructor was sure I was going to fail and that the test was just going to be a learning exercise. That may have been because his attempts at getting me to do an emergency stop always resulted in me gradually rolling to a stop that could have mowed down several grannies. I just couldn’t seem to get myself to reflexively respond to a faked emergency. A tap of a newspaper on the dashboard was not a nonagenarian stepping off the kerb after all. It transpired, however, that my driving examiner was a talker. As soon as he got in the car, he asked me about my fairly rare surname. He was able to geographically pinpoint my paternal family origins – Aberdeenshire – because of it and told me that he was also from Aberdeen. And so followed a test that was really just a monologue from him about Aberdeen and travelling in Scotland and places he had lived with the occasional interruption for him to say, “Turn left ahead” or “do a three-point turn here”. I am pretty confident that most of the time he was not paying full, focused attention to my driving. He asked me to park up and I knew that was the driving element over and that I was now going to be asked some questions to assess my knowledge. As soon as he held up a picture of a triangle with a cow silhouette in it and asked me what this sign meant, I knew I had passed. All the questions I was asked were very basic, the most challenging one being what colour the cat’s eyes are on a slip road. He informed me that I had passed. Phew! But it was when he showed the paperwork to my instructor that he and I were both dumbstruck because there was not a single fault recorded. It was a flawless test. Except that I know it wasn’t a flawless test: I just had an examiner who was so busy gabbing that he had not noticed my minor errors (though none of those would have led to a fail). So that was how I passed my first driving test and became a qualified driver: no specific theory test and a hyper-loquacious examiner. Now I am in the process of undergoing my attempt to become a fully qualified driver in the US. Since I finally – finally! – have all of the documentation I need, today I went to the driving centre to obtain my learner’s permit. I thought all I was doing was obtaining the equivalent of a UK provisional license – a permission slip to start learning to drive, the first hurdle in becoming a fully-fledged, licensed driver. Then came the bombshell that to even obtain the learner’s permit I had to take the Knowledge test. I have not read the Pennsylvania Driver’s Manual. I have flicked through it and I looked up some specific things to ensure I was not breaking the law in the meantime (since I am legally driving using my UK licence and international licence). I have not, however, studied it in any way. The pass rate is 80% with 18 questions. I had that sinking feeling. I was directed to a little booth containing a touch screen. I poked a button and my test began. Multiple choice questions appeared on the screen, I made a selection, confirmed that selection and then the screen would indicate correct (green for go!) or incorrect (red for “You are never going to drive in this country ever, you dimwit!”). And I was getting green after green. How was this possible? Partly it was luck I’m sure. A rash of questions involving statistics would have scuppered me for sure. I was finding I could answer them without much brain-ache by dint of over two decades’ driving experience and simple common sense. I did get two questions wrong: one because I guessed the wrong level of fine for a drink-driving offence (I wrongly erred on the side of harshness) and one because the question and potential answers were so riddled with American terms I could not stitch them together into something coherent to allow me to comprehend what was being asked of me. So I guessed and got it wrong. That was the penultimate question. I got the last one right and a screen appeared congratulating me for passing. It didn’t all go as smoothly though. Being me and my luck there had to be a glitch. That ruddy lost hyphen struck again! My SSN was one of the critical components of my permit application and, of course, in their wisdom the Department of Social Security had failed to insert a hyphen in my surname. It transpires there is also not a hyphen in my surname as it appears on my green card. I am scheduling in some primal screaming just to vent my frustration over this lapse in punctuation. Neither of these documents, therefore, exactly and precisely correspond to my passport, which records my surname accurately. There was some humming and hawing, some referring to superiors, and finally they decided that the SSN was the over-riding supporting document and that, therefore, my driving permit was going to have to be issued sans hyphen. The Curse of the Lost Hyphen strikes again. Slowly but surely US bureaucracy is eroding my identity. But my quest to have a US driving licence is progressing. 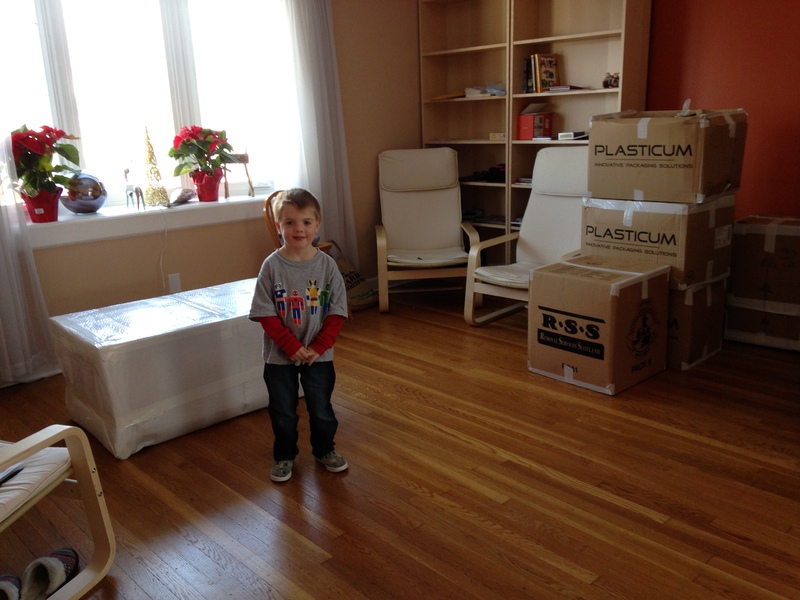 Something amazing happened to us on Wednesday: we finally got our shipping consignment! We last saw our possessions on 26 August. After months of thinning out our possessions by selling, donating, recycling and binning, the remaining items were packed and sealed on a day of back-breaking agony and headed off, as it transpired, into a long period of limbo. We were told it would take about eight weeks door to door as extra time had to be allowed because it would be a shared container – we were not shipping enough things to fill an entire container on our own – and, when pressed, we were informed it would be a maximum of 12 weeks. Ha! Try 16 weeks. It has been a saga of poor communication, ranging from a total lack thereof to wretched miscommunication, misinformation, unprofessional attitudes and staggering incompetence. At one point I had to even step in and do the shipping company’s job for them since they seemed incapable of problem-solving on their own, despite their apparent knowledge and experience. We were told it was on one ship just to find, once that ship had docked, that in fact it had never been loaded on to that ship and was still in Scotland. When it was finally loaded, we were given the tracking information so we could see it sitting on the coast of Ireland going nowhere for a good while. Then, once it finally docked in America, despite being told several times what our Pennsylvania address was, they determined the delivery address was a town in Massachusetts that doesn’t even exist. For real. Yes, they are only things. It’s material possessions. That doesn’t matter as much as us all being reunited as a family and achieving an international relocation just a little over a year from when Mr Pict had his late night brainwave inspired by the Battle of Gettysburg. But it is what those things represented that mattered most to us. Those things are way-markers of a relationship lasting two decades, of our own childhoods and those of our offspring. Those things are physical reminders of precious memories, people known and people now lost, places visited, events experienced. Those things are what makes a house a home. All those nick nacks that are the emblems of us as a family. And then, on a more practical level, some of those things can be hard to live without for a long period of time. Try cooking meals for six people with minimal kitchen equipment for months on end and see how frustrating it is. My kids have had to trudge in the snow without boots and waterproofs because those were all stuck in a shipping container long after they should have arrived. And the toys! My boys have been playing with the same small bundle of toys for months now. They missed their things and needed them. It is also not easy for four young kids to settle into a house that is largely empty and is devoid of anything familiar. Then, on Tuesday evening, came a phone call from the company charged with delivering our possessions asking if we might want to take receipt of them on Wednesday. Not a lot of notice. One might even suggest it is another example of incompetence to not provide more notice. However, we were excited at the possibility we might just have our things in time for Christmas. Note we were excited about the possibility. Not the knowledge or belief we would have our things by Wednesday evening. Just the possibility. Jaded does not come close to describing our regard for shipping companies. Sure enough, Wednesday afternoon rolled around and a removal truck pulled into the driveway. I stood and checked off box after box as two men lugged them into the house and deposited them in three different locations. About a dozen boxes were visibly damaged so I refused to sign the paperwork without adding a note that I had observed the damage and that the contents were, as yet, unchecked but otherwise it was job done in just under two hours. It took almost a full working day to pack it all up but it was all the boxes were unloaded lickety-split. We were left with a house filled with boxes. It was like having an early Christmas. 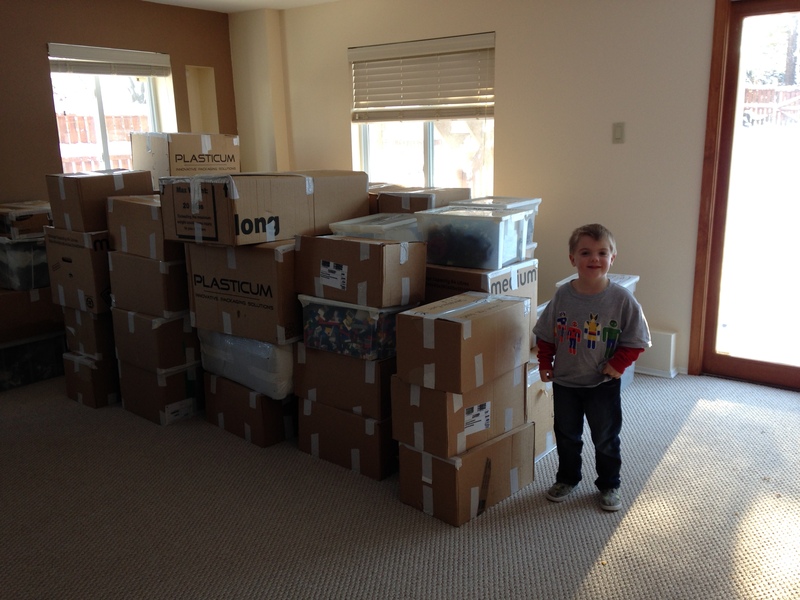 My four year old, who was home at the time, was hyper seeing all of the boxes come in. Despite being told not to open anything without my supervision, he sneakily ripped a box open. He was disappointed that it contained my books. 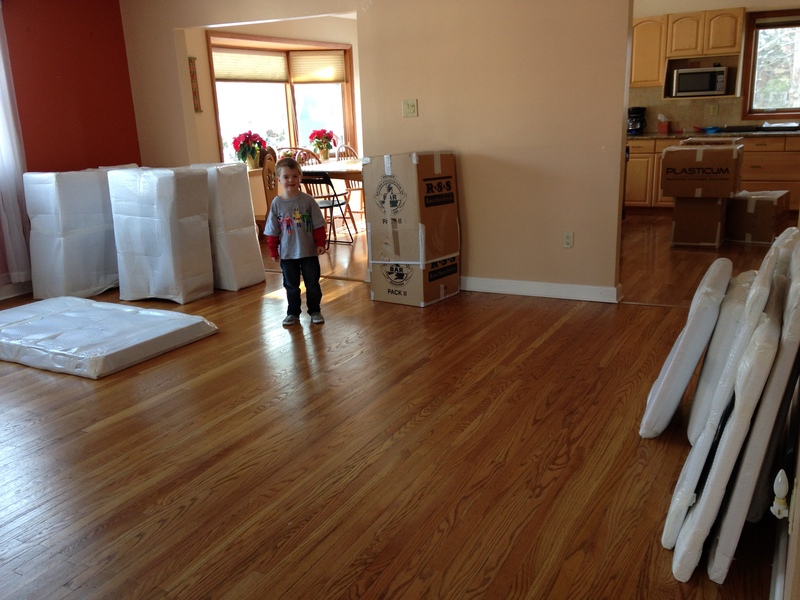 Then, when the older three boys arrived home from school, there were hoots of joy, a spontaneous hallelujah chorus and a whole lot of frenetic jazz hands as they did a pogo dance around the living room – precariously close to some boxes labelled “china”. Then the unpacking began. It takes a long time to unpack things when you are not sure where they should be stored – or when there is no place to put them yet since you don’t have the required furniture – so it is taking a while. I am now 48 hours into when the shipping was delivered and I have probably dealt with ten boxes. I can tell you the exact moment when I opened a box and felt like I might just be able to feel at home here. Indeed I can show you because, as I do with everything, I took a photo of it to record it. 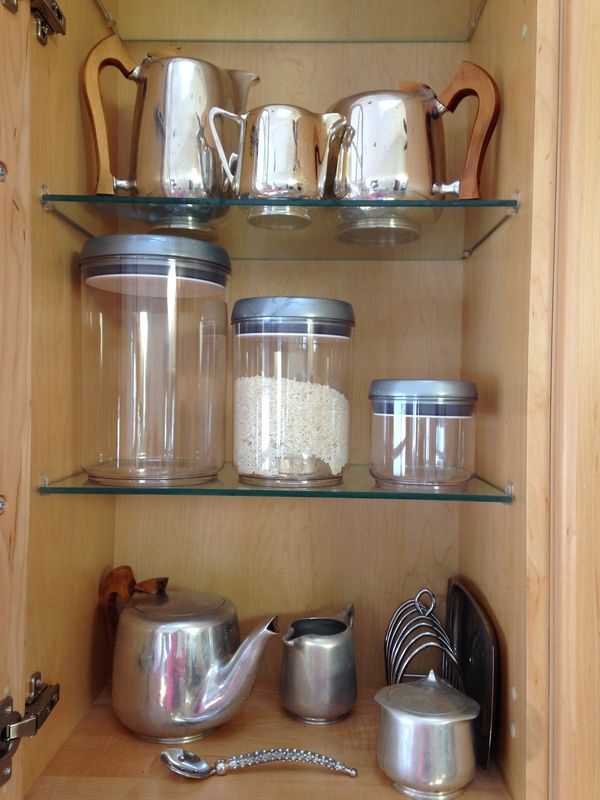 It was the moment when I found my Great-Gran’s tea set and placed it on a shelf in a kitchen cabinet.